As my family and friends know, I am not much of a blogger. I have attempted and failed many times at managing a blog, personal and business, and for almost every reason in the book, it's just not something that I am good at. However, on June 28, 2017, I stayed at the Queen Mary in Long Beach, CA for the night and I really want to share my experience, good and bad. 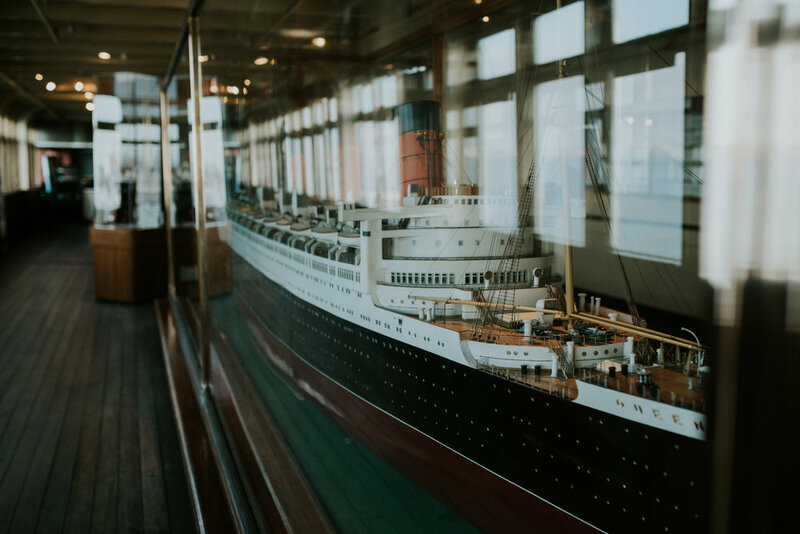 To sum up the history of The Queen Mary, it was once a luxury, First-Class ocean liner in the 1930's. 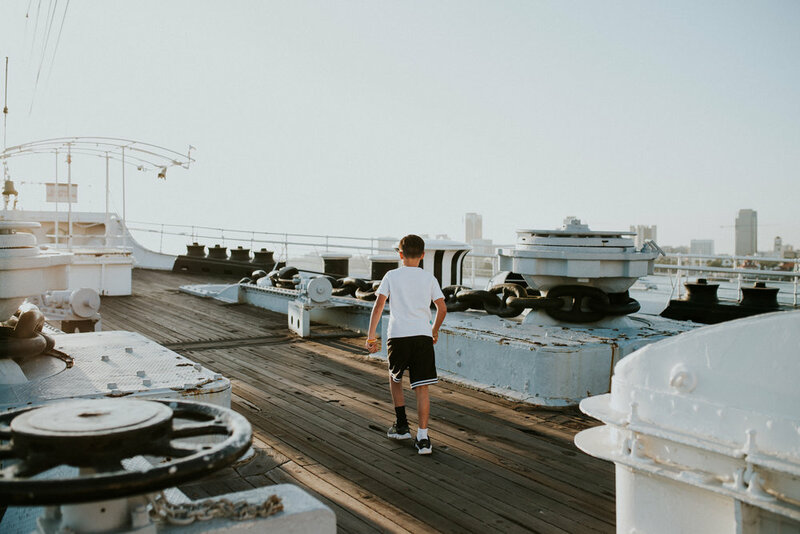 During World War II, it was transformed into a troopship and carried hundreds ofthousands of soldiers, war brides and their children, and prisoners of war. 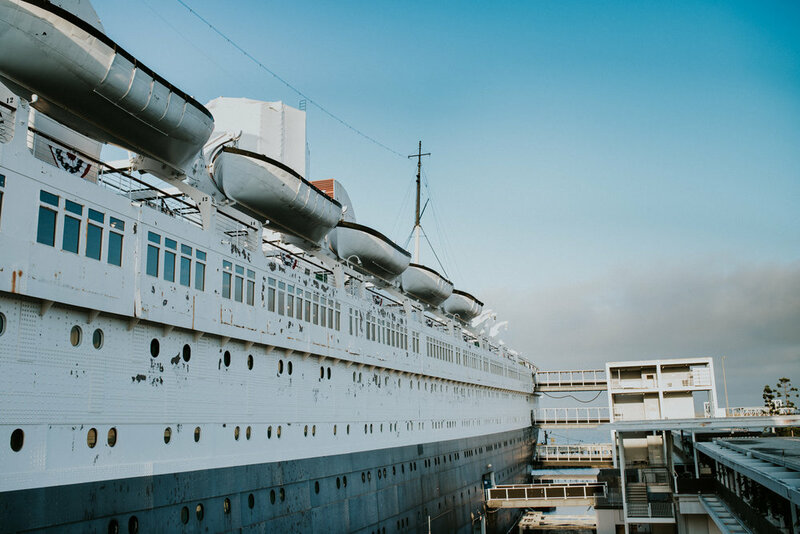 In 1967, she was sold to the City of Long Beach to be transformed into a Museum and Hotel. She is known to be one of the top 10 most haunted places in America, filled with spirits of past guests, soldiers, children, and employees. Our oldest child spends every summer in Texas. This summer he will be away for 6 weeks, which is the majority of every school-year summer. So I researched and looked up for a few weeks what him and I could do for a mini vacation before he left. I wanted to give our son a fun, overnight trip so he could have a memory with me for the summer of 2017. I was looking at amusement parks, aquariums, museums, basically everything. I was completely open and just wanted something fun for him. However, I am the money-pincher in the family and the only hotels under $250/night looked like it was from a slum scene in a movie. I was NOT about to stay in these shady hotels, especially by myself with a child. So it was coming down to just a couple of days before he was leaving and I was still undecided on a hotel. Scott, my dear hubby, as looking online for something fun, bursts out.... "Oh my god, shut up, y'all can stay at The Queen Mary". Of course thinking 'yay, he finally found a hotel worth staying at that won't cost a ton of money' and then I'm like "Wait! What is the Queen Mary"? After reading about it and reading it is haunted, my immediate response was "NOPE. NADA. NO WAY am I staying there"! But also in the back of my mind, I'm thinking how awesome would it be to stay on a real ship; a ship that has carried Walt Disney, Aubrey Hepburn, The Queen and many more. We've never been on a cruise and the chances of us going on a cruise in the future are slim. So I turned to good ole social media and asked my friends who have visited The Queen Mary for their experiences, thoughts and suggestions. I received a lot of responses going in both directions, but no one experiencing any ghosts or spirits. After a full nights rest and giving it much thought, I made the decision to stay there, not because it is known to be haunted (because I am the biggest chicken ever), but so that our son can stay a night on a historic ship that once sailed across the ocean more than 1,000 times and I know that he would love it. And he did just that! Me, on the other hand, well... that's a different story. I'll start off by saying that I am a Christian, I have Jesus in my Heart, I believe in God, the Angels, the Devil, and I believe spirits are among us, both good and bad. My grandmother's past home was haunted by a farmer who was murdered atop the stairs to the attic. Although I did not personally see or feel him, the attic was always incredibly creepy and I remember stories my grandmother has told me. I won't go into details about they stories and background of that home, but it is one of my past experiences that has led to why I am a believer in spirits and ghosts. I am deathly afraid of horror movies, so much that I close my eyes and ears when a preview comes on TV for any scary movie or show. So the thought of the ship being haunted, already had me afraid to go. But I would tell myself "it's just a ship Jessica.... nothing else, and my son is going to love exploring the ship. You got this.... so many people stay there and it's just fine". As we pulled up to the parking lot, it was definitely so much bigger than I ever imagined. As we were walking up to the ship, my son immediately said "oooooh.... this is awesome.... it's just like Transylvania"! Where he got that from, I have no idea. I would have to re-watch the movie and see if there is a ship in the movie, but it was definitely a big "uh oh" moment for me. I brushed it off and we kept walking. Immediately upon entering the ship, it was like stepping into a time machine. I felt as if I had entered into another century. The colors, the walls, the carpet, there was gold everywhere, the music from the 1930's, and it was cold. "This is awesome. How cool is this"? The front desk was extremely welcoming. 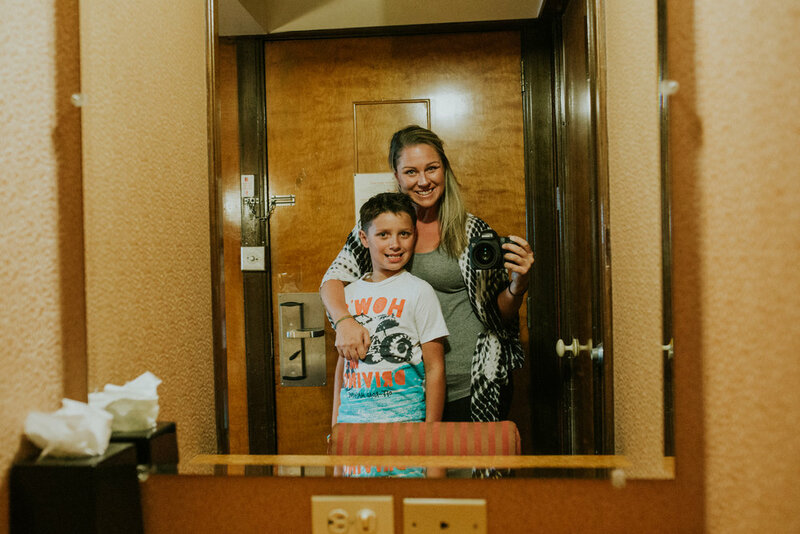 We were both so excited to get checked into our room and start exploring! As we started our walk to our room, that's when things started changing for me. The halls were dark and cold. They were like walking a maze. It was so easy to get turned around and lost. Everything was eerie; my fears had presented themselves. Just as the halls had presented themselves, the rooms gave off the same feeling. I had read and expected the rooms to be outdated. The hotel is continuing to be refurbished, but the original decor is being preserved. Our room was a double twin bed and I knew the moment we opened the door that we were sleeping together in one twin. The shower still had a salt water option, which I thought was really neat, but the bottom of the tub was rusted and the paint was peeled/peeling off pretty bad. There is a video on the internet of paranormal activity in one of the bathrooms that I see every time I google The Queen Mary hauntings, plus the fact that so many horror films usually has a scene in a bathroom made it an easy decision for me to not take a shower that night and to stay out of the bathroom as much as possible. (I wasn't lying when I said I am a huge chicken). I had some trouble with the lights at first but finally figured them out. 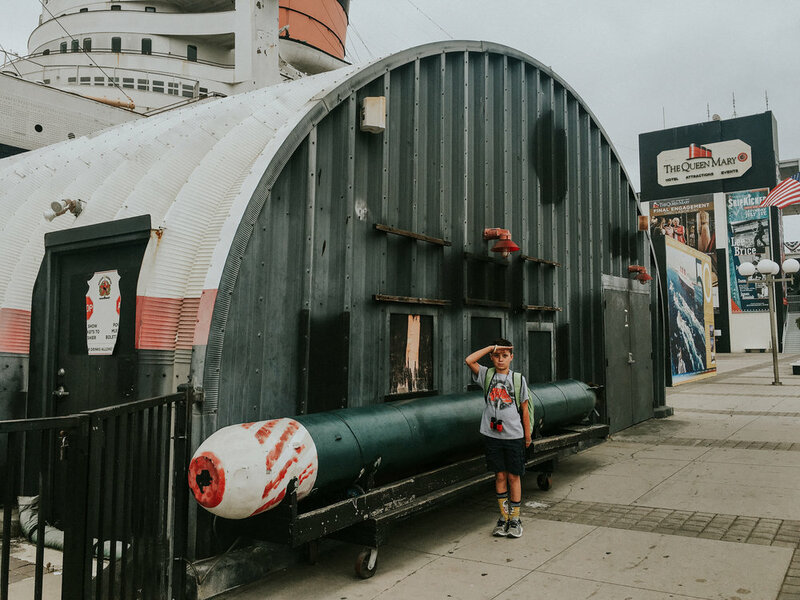 Once settled in and looking around the room for a few minutes, we went straight for the Promenade Deck, which is the public area that had the Observatory Restaurant and Bar, gift shops, museum displays and more. It was pretty neat to see. This is also where the majority of tourists and guests could be found. We did not eat at the restaurant for dinner and a lot of areas/doors were locked and inaccessible. We found our way to the Upper Deck which was also where the fire station used to be. We really enjoyed this area of the ship. 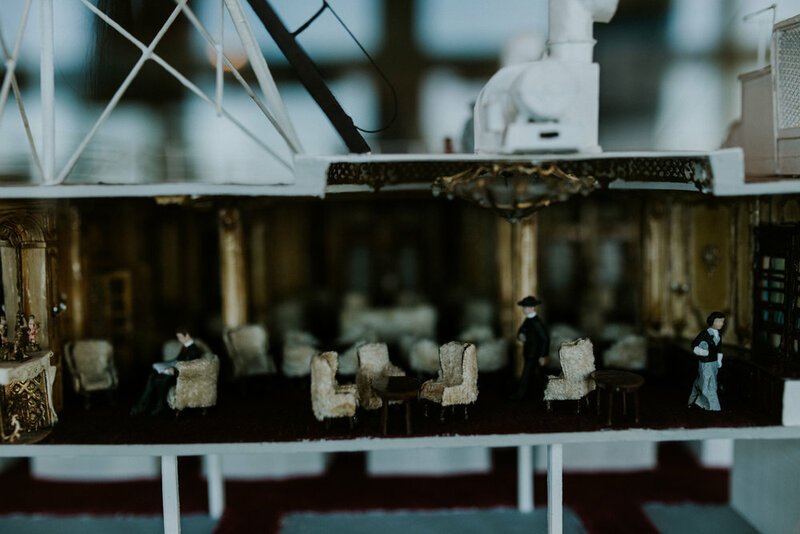 On our way back to the lobby, in the midst of scrambling through the creaking, windy halls, we stumbled upon the East side of the Promenade Deck (somehow we missed earlier) which had many lego replicas of The Queen Mary and other famous ships. My son is a huge lego fan so we spent the most time looking at the displays. The outside of the ships' decks were well lit and there were (most of the time) other guests and visitors around you doing the same thing. My fear had subsided for the moment and I truly enjoyed exploring the ships' displays. We did one more quick lap around the Promenade Deck before heading to Downtown for dinner. We stopped to look at the Child's Play Room display. It was filled with a child's play table, chairs, books and toys from the era the ship was in use. It was a little eerie but also sad to think that these toys used to make so many babies and children happy. I cracked a little joke to my son about how children in the past didn't have movies and iPad's to play with, snapped a couple of pictures, and moved on. This room was enclosed in glass and you can see the reflection from myself and the walls behind us. Once I transferred my pictures onto my computer, I saw something else in one of the images. Something that was definitely not a reflection and was not visible to the naked eye. I personally see a little boy, his face, shoulders and possibly a coat; the bottom tapers off so I can't distinguish much else. You can decipher on your own what you see and/or don't see. As mentioned earlier, we did not eat dinner aboard the ship. We spent the rest of the evening downtown Long Beach for a little shopping and dinner at The Yard House (which is a favorite of ours). But we could only stay out for so long because of our plans for the following day. There was no avoiding the fact that we needed to go to sleep, or attempt to sleep for me. My son and I both slept in the same twin bed. It was one last sleep before he headed to Texas for the summer so of course I was taking in all of the snuggles and cuddles I could get. We watched some tv and eventually dozed off. The night was an experience I wouldn't want to happen again. I had already worked myself up, my head racing with fears, my anxiety already high and on-edge. I didn't sleep much because of my fears, I watched tv, played games on my phone and tried to keep myself occupied as best as possible. The walls are thin so you can hear other people. The toilet water ran on and off all night, the bathroom sink had a slow, constant drip. This I was prepared for, but definitely didn't help settle my thoughts. At 3:12am, something in the room vibrated for about 10-12 seconds. It wasn't my phone or son's tablet. I tried to listen really hard thinking maybe it was coming from another room. This wasn't the case. It was coming from somewhere in our room, but I never figured it out. I eventually went to sleep but only for a short bit. The next thing I remember, I felt as if somebody had sat down on my chest quickly and abruptly. You know, the kind of sitting when you quickly fall to sit in a chair to put on socks or shoes. The feeling was heavy and hard, like a huge rock or brick. I couldn't breathe, gasped for air, sat up quickly and immediately began praying for comfort and peace. I didn't go back to sleep after this. I remember looking at my phone for the time but I can't remember if it was around 4:30am or 5:30am. Now, I am not in any way saying that I experienced a spirit in our room. It could have easily been a full on panic attack in my sleep or a horrible, fearful realistic dream. I cannot say for certain what happened. I can only speak for my personal experience. To wrap things up, I am glad that we were able to visit a ship with so much history. My son loved every second and this will be a happy memory he will never forget. Would I go back to the ship? Yes, but only during daylight to tour or eat. 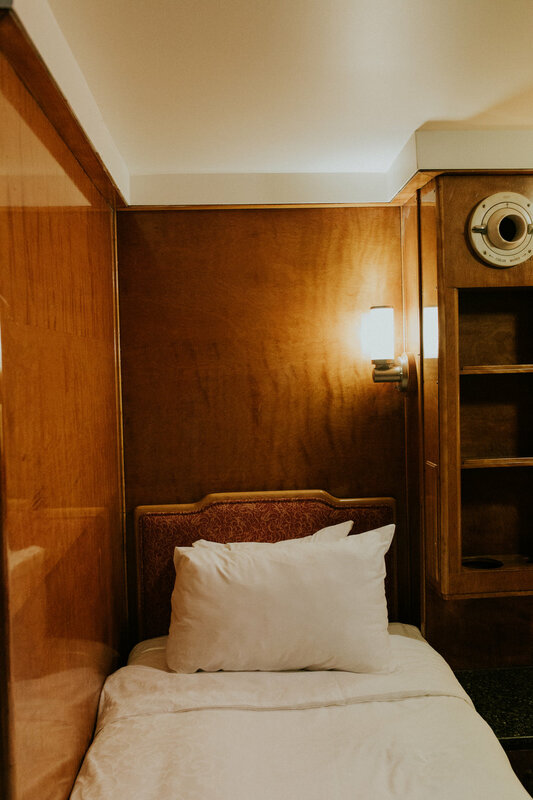 The chances of me sleeping on the ship in the future are none to zero. Scott wants to go and stay the night, after all this was his idea, ha. But i'll sit that one out. I do think everybody should stay at least once to form your own opinion and experience. Do not assume or judge based on the opinions of others, including this blog post. The Queen Mary was definitely one for the books. I would love to hear if you have stayed here and what you thought of it. Feel free to leave a comment, but please refrain from any negativity. Much love. What is a senior rep you ask? A senior rep is someone that is a spokes model for Jessica Swaner Photography. Their job is to participate in a discounted senior session and tell all their friends and classmates just how great their senior portrait experience was! My hopes are that once your friends see how gorgeous your photos are, they are going to come to me for their senior portraits too! • Senior reps must fill the form at the end of this post and be accepted in order to represent Jessica Swaner Photography. Only 3 reps from each high school will be accepted. • For every friend you refer to me who books and completes their session, you will receive CASH rewards. • Senior Reps and a parent or guardian must sign a senior rep contract with full model release for advertising purposes. • You and your parents must agree to promote only for Jessica Swaner Photography for your senior portraits from the time of acceptance through the entire 2016/2017 school year. • You will receive a minimum of 10 watermarked, web-sized images to use as your Facebook profile/cover picture and will be required to use one of them for at least 6 months. • A discounted session fee of $225 is required upon the signing of your Senior Rep agreement. FREE Stylized session this Spring (2016), with a minimum of 10 photos for promotional use (Social Media and Rep Cards). This shoot will be a group session with the other Senior Reps and will last up to ONE hour, with styling, and professional hair and makeup. You will be using the images from this session to advertise throughout the year! With this session, you will be provided 50 customized referral cards with your name, photo & my contact information to pass out to your friends! Discounted Full senior session, including an online gallery with a minimum of 75 full resolution images (the discounted senior investment is $225). A Senior Rep spotlight blog post featuring YOU! ***There is no limit for referrals. The more seniors you refer, the more money in YOUR pocket. • You must currently be a 2016 Junior, graduating in 2017. • You must be able to exclusively represent Jessica Swaner Photography to friends and other juniors and seniors in your school and community. • Parental consent is required to participate! There really isn’t one! If someone sees your pictures and likes them, then give them your rep card and tell them how to contact me! That’s it! You are NOT expected to discuss pricing or packages with them. Prints are NOT included. Upon receiving your online gallery, you will have access to download your images, therefore, allowing you to print your images at the lab of your choice. • Your parent’s permission is crucial. • You will need to sign a Senior Rep contract and Modeling Release. • You will ONLY promote Jessica Swaner Photography. Thank you for your interest in becoming a Senior Rep for Jessica Swaner Photography. Both the Senior and a Parent/Guardian will be required to sign a Senior Rep contract that includes a Model Release for advertising purposes. )This will be emailed once all Senior Reps have been chosen. ARE YOU READY TO HAVE THE BEST SENIOR EXPERIENCE AND REPRESENT JESSICA SWANER PHOTOGRAPHY? If so, please fill out the form below. JSP will be in contact with you shortly after receiving your information. 1. Enjoy your senior session and RAVE about it to all of your friends. 2. LIKE JSP on Facebook and follow JSP on Instagram. 3. Post and share images on all social media accounts you have. 4. Use watermarked images as your Facebook profile picture and/of cover picture for 6 months. 5. Represent JSP Exclusively. Not interested in becoming a Senior Rep but still want an awesome Senior Portrait Session? Great, just contact me at info@jessicaswanerphotography.com for the current Senior Session Collections. $100 non-refundable booking deposit is due to secure your session. The remainder is due at your session. The booking deposit is non-refundable. Time slots will be in 30 minute increments. (5pm, 5:30pm, 6pm, 6:30pm) When booking your session, please send me your top 3 time options. Time options will be first come, first serve. Exact location/meeting place will be sent a couple days before your session. I will have props to use…. a treasure box, pearls, glitter, flower crowns, and of course a DINGLEHOPPER. Sessions will be 30 minutes long. You will receive unlimited images through a personal online gallery with printing rights. The full outfit is handmade from one of my favorite Central Coast’s Boutique, Sunshine and Daisies Children Boutique. 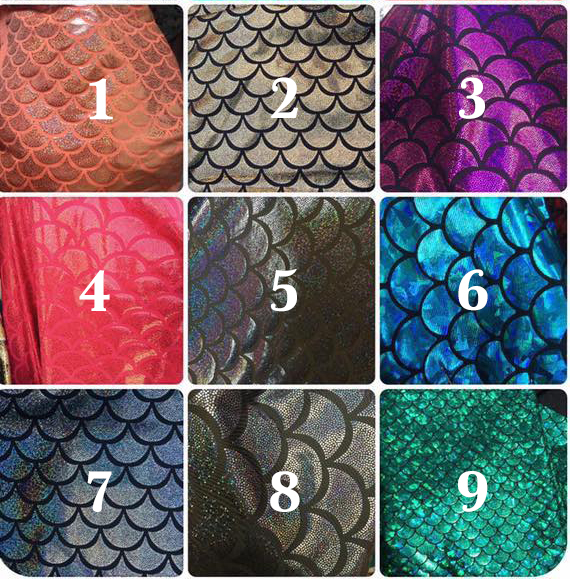 The outfit will include a bikini top and mermaid skirt that is custom made just for YOUR daughter and after the session, she will get to keep the outfit! You will need to send me her top/skirt sizes upon booking. The designer will begin working on the outfit once your deposit is paid and your session is booked. INCLUDE YOUR CHILD'S NAME, AGE, SIZE, OUTFIT COLOR CHOICES, AND YOUR PREFERRED LOCATION/DATE/TIME.